Time capsule planted in 1982 to mark the centenary of the Port Macquarie News. The paper was first printed and published on 8 July 1882 by Alfred Edward Pountney as the Port Macquarie News and Hastings River Advocate. It was published under this name from 1882 - 1950. The paper was circulated in the Bellinger, Nambucca, Macleay, Wilson, Camden Haven, and Manning Rivers, and throughout the whole of the Port Macquarie and Hastings River district. The Rt. Hon. 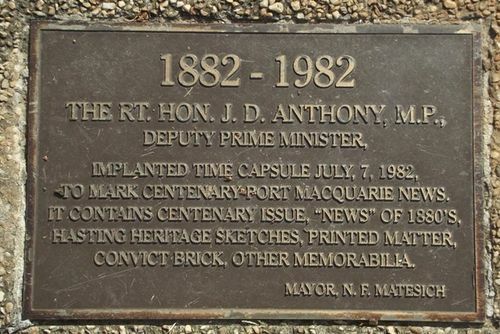 J. D. Anthony M.P Deputy Prime Minister implanted time capsule July 2, 1982, to mark centenary Port Macqurie News. It contains centenary issue "News " of 1880s, Hastings Heritage sketches, Printed matter, Convict brick, Other memorabilia.